Who among us hasn’t forgotten things in a mid-morning rush? Can Monday hurry up, please? Does this mean we’ll be seeing a return of Selkie’s mom? Don’t think he has anything to do with this, he only showed up weeks after Selkie got dropped off. Basically, regardless of whom the bow is transmitting to, by definition they are someone Agent Brown probably wants to know about and he might show up to investigate. 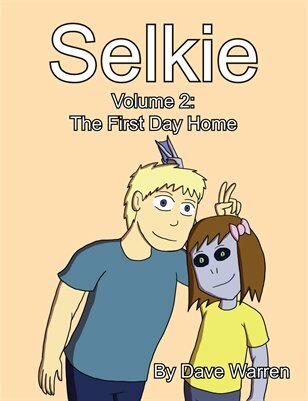 So… Selkie has effectively been wearing a tinfoil hat since she was turned over to humans? well who’s knows but pohl did tell todd in page 404 that Sar’Teri have been give threats of military retaliation should they take action against refugees. I thought she lost it in the snowball fight ( https://selkiecomic.com/comic/selkie307/ ) and don’t recall her getting it back. I kinda expected someone returning it to be a plot point. rylen that was one of selkie’s pads that help keep her warm. Hmm. I can see that. I suppose I thought that was a fun bit of pathos and wanted it to happen. Thanks. She didn’t lose it. That was a heating pad, the bow is still in her hair by the last panel. DAMNIT DAVE! Why did you have to leave us on a cliffhanger like that!? Transmission?? TRANSMISSION OF WHAT??? Awww man, I hate waiting!! dave what does this mean. I feel for Selkie. Nothing’s worse than feeling fancy and not being able to dress up because the weather isn’t cooperating. Superb use of Chekhov’s gun! Did you always intend this? Wait… how did I do that? Schrodinger’s comment, your comment neither existed or un-existed at the same time, therefore causing a paradox where you comment twice breaking reality. Aw man, did I break reality AGAIN? Thanks for the repair, Dave. Waiting. With anticipation and curiosity maxed. Come on Dave, please? When they came back, the apartment building was a glass crater.